What Functionality Does a Querying and Reporting Tool Provide? Run regular reports. Your organization might regularly produce standard reports that come from an operational system or from data extracted from one or more of those systems. Create organized listings. You might produce a list of all the salespeople in your company or those who meet a specific criteria (they cover more than two territories, for example), and their sales in the most recent month. Organized means that you can list your report or query alphabetically by salesperson’s last name; alphabetically by customer name and the salesperson who covers that customer; by rank, from highest sales revenue generated to the least; or any other way you want to look at the data. This figure shows an example, using fictional company names. 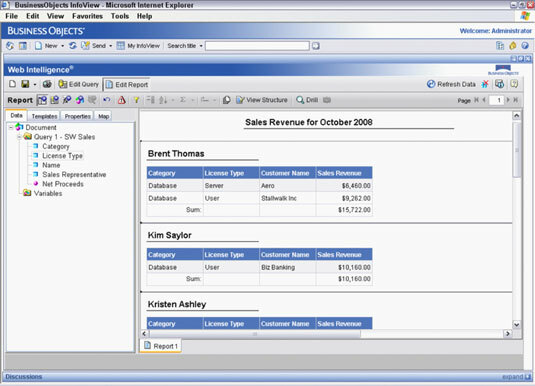 Perform cross-tabular reporting and querying. 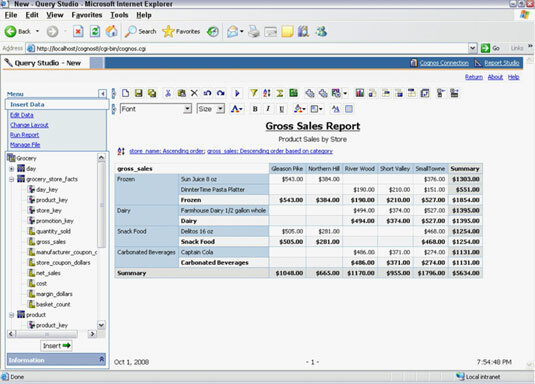 Cross-tabular reports, sometimes called cross-tabs, are slightly more complex than a basic organized listing of data. In addition to the sequential, ordered vertical listing (the company’s salespeople), you see across the top (the other axis) of the report a decomposition of various categories and values associated with each category. In the example shown in this figure, sales revenues are broken down by product. The barriers between business analysis/OLAP tools and products that have historically been oriented toward querying and reporting are getting somewhat grayer. Query tools, for example, commonly also permit some level of drill-down, an OLAP function that enables you to see underlying, more detailed data.